The real estate market for Cashiers and Highlands area had a slow start. However, its end made up the difference. The real estate market for this region has been sluggish for some time now. 2016 started to show no better signs than previous few years. However, about mid summer there appeared to be a turn for the better. It’s true that this area always has an increase in the summer months, but this summer seemed to surpass the previous 2 years. In the end there was an overall positive effect. It is important to note that we are heading into the historically slower part of the year once again. Total homes listed in Highlands/Cashiers MLS: 844 This is a drop of nearly 400 homes! While many will take their home off the market for winter months, this proves exceptionally beneficial for sellers as there is less substitution (competition). This is an excellent time to list a home. Homes Sold This Month: 64 Previous years were in the 40’s & 50’s. This gave us the strongest December we’ve had in a few years. Average Unit Sales per Month/1 Year Average: 51 Another increase. As we see the number of units sold increase, this helps us to see that more and more homes are being sold. Another positive for Sellers. Inventory: 16 months – This is much better than the nearly 2 years worth of inventory we had been seeing. However, this figure can be somewhat misleading. This is due to the significant drop in inventory (nearly 400 homes). Much of this because many take their homes off market during winter months. If we had those 400 homes back into the equation (which is what will happen in the spring) this will bring us back to an inventory in excess of 20 months. Either way, a healthy inventory is considered to be 6 months or less. Average DOM: 339 This number is showing some decline. Another positive sign. Here again, Sellers should not expect a quick sale. Homes are moving, but with all the inventory available, Buyers have much to choose from. Average DOM (YOY): 443 – Another positive sign. We use this Year Over Year Average to give us more accuracy in the overall sign of the real estate market. Median Sales Price: $327,640 While previous years showed the Median Price to hover in the $200,000 mark, 2016 showed significant increase to push us over the $300,000 mark for the year. This is not the average selling price, but the “Middle” of the market. For example, if 15 homes sold for varying prices, this wold have been home #8. The chart below helps represent this. 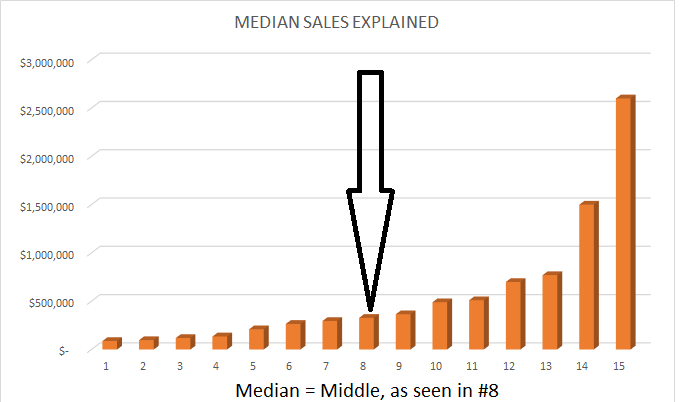 This is not a representation of any actual sales, but a means to explain how “Median” Sales Price is derived. Average List/Sell Ratio: 92.3% – Sellers are not getting full asking price for the most part. Some feel they should price high to give negotiating room. This is not always the best strategy for Sellers. If you’re priced too high to begin with, people may not even consider looking at your property. If you’re not getting many showings, most likely this is due to pricing. Where is your Market Share based upon sales? Consider the chart. Synopsis: There are significant signs of improvement in the Cashiers and Highlands real estate market. Still, buyers see the market as priced high. Consider how many showings you’re getting as an indication of Buyers interest. If you price it right, they will come. Land Units Sold: 26- This is the best December in 3 years. Still, in comparison to the rest of the year, it’s nothing to get excited about, yet. There have been several new housing starts. Will land sales begin to return? Hopes run high, but only time will tell. Total listed in all MLS: 1012 Very large inventory. Synopsis: Land is moving. There is still nothing significant that would warrant any expectation that land sales will have any significant increase. This forces prices to be held low. 43% of home sales ranged from $200,000 to $499,999. 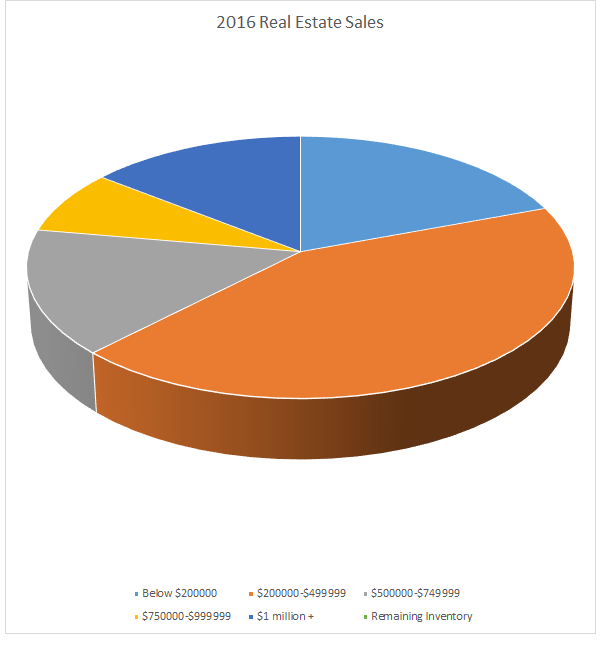 15% of home sales ranged from $500,000 – $749,999. 8% of home sales ranged from $750,000 – $1,000,000. 2016 has been a favorable year. While one may not call it a stellar year, it has shown many positive signs. This broker has seen an increase in people looking at properties since the end of the election and beginning of new year. Properties are already under contract, ready to close soon. BUYERS: As markets start to rise and positive signs offer hope, now may be an opportune time to consider making that purchase. SELLERS: While we all have hope that there will continue to be an increase, don’t get to far out ahead of the market. You may want to take advantage of this opportunity to make sure your property is listed and listed at Fair Market Price. If you’re considering listing your home for sale or purchasing a home in NC, please feel free to contact a top Franklin Highlands Cashiers agent and REALTOR®. They will make a specific report for your area of our MLS (Sapphire, Norton, Glenville, Highlands, Toxaway, Clear Creek, Breedlove, Franklin, etc). You can then make an informed decision on how to sell or buy your home.